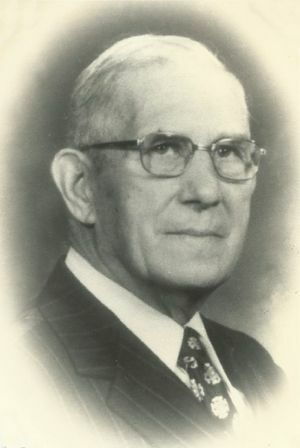 Jacob Janzen: community leader; born 23 May 1900 in Sergeyevka, Fürstenland Mennonite Settlement, South Russia, to Johann D. Janzen (1 October 1871, Burwalde, Chortitza Mennonite Settlement, South Russia - 1938, USSR) and Helene (Janzen) Janzen (15 April 1879, Sergeyevka, Fuerstenland, South Russia – 4 May 1917, South Russia). Jacob married Elisabeth "Lise" Neufeld (23 October 1904, Reinfeld, Russia – 31 July 1994, Clearbrook, British Columbia, Canada), daughter of Heinrich D. Neufeld (1884-1919) and Maria (Walde) Neufeld (1885-1967) on 7 May 1923 in Altonau, Zagradovka, South Russia. Jacob and Elisabeth had four children: Edwald, Katherine, Helen, and Ernie. Jacob died on 8 March 1977 in Clearbrook, British Columbia. Jacob was the eldest son of the general manager of the Janzen & Neufeld Factory and eldest grandson of the owner, Jakob Wilhelm Janzen (1845-1917). He had a privileged childhood in stark contrast to his later teen years and early adulthood, as the First World War and then the Russian Revolution resulted in chaos and starvation. Jacob was conscripted into the Red Army and severely wounded, resulting in his assignment to a desk job. He was soon assigned to the Molotschna region to oversee the census ordered by the new Communist Government. Here he met Elizabeth Neufeld. They were married in 1923 and shortly thereafter, were baptized into the Mennonite Brethren Church. In 1925, Jacob and Elisabeth and their infant son moved to Canada, along with his widowed mother-in-law and her children. The Janzens farmed for 20 years in Saskatchewan and Alberta, during which time Jacob also managed a cheese factory in Alberta and spent significant time collecting the travel debt (Reiseschuld) incurred with the Canadian Pacific Railway by Mennonite immigrants of the 1920s. Jacob and his family moved to Clearbrook, British Columbia in 1945. Jacob’s interest in community life, both in business and church activity, was soon evident. He served as secretary-treasurer of the Clearbrook Mennonite Brethren Church for many years, and as secretary-treasurer on the Mennonite Educational Institute board during the construction of its new building at the corner of Old Yale Road and Clearbrook Road. In 1948 Jacob was a founding member of the Abbotsford Growers Co-­op, and General Manager during its formative years. This co-­op eventually became the largest processor of raspberries in Canada. He was also instrumental in creating Consolidated Coast Marketing, an agency created to jointly market all of the raspberries for the growers in the Fraser Valley during that time. In 1958 Jacob was a founding member of the Clearbrook District Mennonite Savings Credit Union. Jacob served as secretary-treasurer during its early years, and proudly utilized his account, which was #1. Jacob was also involved with the formation of Clearbrook Waterworks. Jacob's talents where utilized as he designed the early stages of the utility and supervised the construction. He operated and managed the water utility from its beginning in 1954 until he relinquished the position in 1966. Jacob was the first president of the Clearbrook Chamber of Commerce and worked hard to recruit businesses, doctors, and other professionals into the area. Among these where the music teachers Walter and Menno Neufeld, who taught in a portion of Jacob Janzen's home that he had converted temporarily into a studio. Since Clearbrook was not an incorporated entity there was no post office, which did not sit well with Jacob. Jacob initiated a campaign to obtain a Clearbrook Post Office, which he eventually succeeded in doing. In 1959 Jacob successfully campaigned for a seat on the Matsqui Municipal Council, where he remained for nine years until his retirement in 1968. During much of this time he represented the Municipality on the Board of the MSA General Hospital Society. In 1967 Jacob was awarded the Centennial Medal and in 1971 he was honored as a "Freeman" of the Municipality. Jacob was a visionary, and action followed dreams very closely. He could have used his considerable foresight and managerial skills to amass personal wealth but he consistently chose to pursue the common good. He generally avoided the limelight but chose rather the position of secretary-treasurer in any organization as it afforded him a more active involvement in the operations of any organization he served. Janzen, Ernie. "Janzen, Jacob (1900-1977)." Global Anabaptist Mennonite Encyclopedia Online. June 2016. Web. 19 Apr 2019. http://gameo.org/index.php?title=Janzen,_Jacob_(1900-1977)&oldid=141860. Janzen, Ernie. (June 2016). Janzen, Jacob (1900-1977). Global Anabaptist Mennonite Encyclopedia Online. Retrieved 19 April 2019, from http://gameo.org/index.php?title=Janzen,_Jacob_(1900-1977)&oldid=141860.